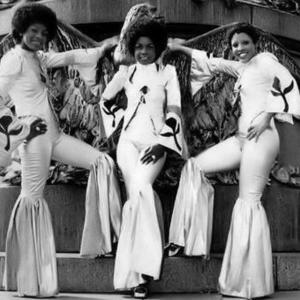 First Choice is a three-piece 70s disco girl group, similar to The Three Degrees but more sassy, with Rochelle Flemming on lead. "I got something for your mind, your body & your soul"/ "It's Not Over" are probably their most sampled lines (from the perennial "Let No Man Put Asunder"). Originally signed to Philly Groove Records via a production contract with Norman Harris, the group came with Harris when he signed onboard the newly formed Salsoul. Most of Harris' work would be issued on the Gold Mind subsidiary of Salsoul - First Choice were no exception. Originally signed to Philly Groove Records via a production contract with Norman Harris, the group came with Harris when he signed onboard the newly formed Salsoul. Most of Harris' work would be issued on the Gold Mind subsidiary of Salsoul - First Choice were no exception. The bulk of the group's offerings came from the stable of Baker/Harris/Young, but other producers and mixers would feature prominently, such as Tee Scott and Tom Moulton (whose mix of "Dr. Love" is the all-time favorite of Salsoul Label head Ken Cayre). "Let No Man Put Asunder" would not reach it's penultimate destination in every urban DJ's front crate until Shep Pettibone re-worked it inthe early 1980's. The group had recorded a Southern Soul styled version of Al Green's "Love and Happiness" for their sole Philly Groove album, where it sat alongside the major hit "Armed and Extremely Dangerous" and the minor hit "Smarty Pants". Salsould would eventually re-mix and re-issue all three tracks in various incarnations, leading to the misconception that they were vintage Salsoul cuts. In fact, they were vintage Baker/Harris/Young productions that preceded Salsoul and were acquire by the label after the fact. Lead vocalist Rochelle Fleming enjoys a reputation as one of the legendary disco divas, and still lends vocals to the occassional one-off house track, such as Tom De Novy's "Summer Love". First Choice was an American girl group vocal music trio from Philadelphia. The group produced the disco hits "Armed and Extremely Dangerous", "The Player", "Love Thang", "Let No Man Put Asunder" and "Dr. Love". Fleming was the main vocalist. The group was originally known as the Debronettes. Philadelphia DJ Georgie Woods introduced the trio to Norman Harris, guitarist with MFSB, to produce their debut single, "This Is The House Where Love Died". Although it sold poorly, the record led to a recording contract with the Philly Groove record label, and the release of Armed and Extremely Dangerous. Also produced by Harris, the song was a hit first in the UK, where it reached the Top 20 in the UK Singles Chart on Bell Records. U.S. success followed and the later singles, "Smarty Pants" and "The Player," sold equally well. While producer Harris was associated with numerous hits during the disco boom of the late 1970s, the only later chart entry for First Choice was "Dr. Love," and, in 1984, the group split up. In 1983, however, the group's 1977 album cut "Let No Man Put Asunder" was remixed by Shep Pettibone and Frankie Knuckles for club play, and became a staple for urban DJs and a classic for listeners. The centerpiece vocals and bass riff of the song were among the most sampled expressions of the emerging Chicago house music scene in the 1980s. Steve "Silk" Hurley used this bass line in his 1987 song "Jack Your Body," which went on to become the first house record to top the UK charts. In 1987, Fleming re-formed the group with her cousin Laconya Fleming, and Lawrence Cottel, to record Love Itch (Prelude Records). In the same year, a reissue of "Let No Man Put Asunder" was a dancefloor hit in the UK. Over the years, the group has seen some new success, as many of their songs have been remixed and re-released. Larry Levan remixed its "Double Cross" (Gold Mind, 1979) track, plus Tee Scott's first studio mix was "Love Thang" (1979)). It was also remixed by Tony Humphries in 1993 for the Salsoul remix project, two albums released on Double J Records. First Choice benefitted somewhat when Rhino Records put its Armed and Extremely Dangerous into the Soul Hits of the 70s: Didn't It Blow Your Mind series, and also when the Salsoul catalog was digitally remastered and released in the 1990s. Fleming has also provided guest vocals for the occasional house music release over the years.